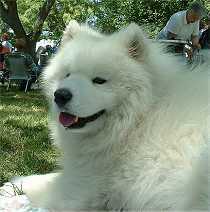 This section of the Samsite is devoted to the biography of my Samoyed "Ziggy". My best friend Ziggy passed away in 2003 leaving some incredible memories but a huge wave of sadness. 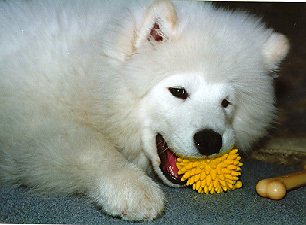 At the beginning of 1996 I had no idea that I would one day be the proud owner of a Samoyed. I had a small Westie called "Parsley" who was normally referred to as "the pig" due to her rather portly nature and pink skin. Parsley had a terrible Westie skin problem which always seem to be better when my parents dog "Jasper" came to say. This seemed to provide me with the ideal excuse for getting the big dog I had always craved. I really fancied an all white pyrenean mountain dog but our house simply was not big enough for one. Next on my list was a Husky but after talking to a few breeders and owners clubs I decided that a Husky was just too wild to be the family pet I wanted. Whilst out walking with Parsley one Sunday I saw my first ever Bernese Mountain Dog and this breed seemed to fulfill all of my criteria and was quickly added to my list of prospective dogs. I visited a Bernese breeder near Carslisle in the the Lake District and was stunned at just what good natured and beautiful dogs they were. The only downside that kept preying on my mind was that they typically only live to about 6 years old, but then again this is a real big dog problem. Somebody suggested that a Malamute would be a better bet if I really wanted a spectacular northern breed and after meeting one I had to add these to the list too. So with a working list of a Bernese Mountain dog and Alaskan Malamute I decided to visit the 1996 Crufts dog show on working dog day to choose a breeder and to consult with the various owners clubs. Crufts was magic, I was in seventh heaven seeing so many fantastic dogs. I spent hours there talking with breeders, owners and experts. Around lunchtime I decided to try to find my wife who had gone off looking round the show by herself and in doing so I stumbled across the Samoyed section. I was hooked there and then ! I spent nearly two hours in the Samoyed section until my wife finally rescued me. Samoyeds met all my criteria, they were a stunningly attractive looking dogs , fantastic temperament , powerful and they could live for a decent amount of years. 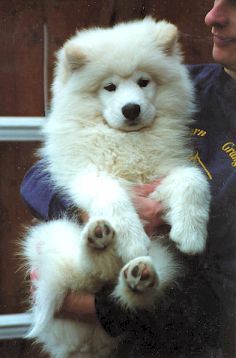 I told my wife that a Samoyed was the dog for me and was overheard by a lady from the Northern Samoyed Association (who's ear I had been bashing for the last twenty minutes) and she said she new of a good breeder that was selling her last two remaining Samoyed puppies for a genuine reason. A week or so later I traveled up to the North East of England to view the two pups and their parents and confirmed that the puppies were from both a good home and a good breeding stock, they were perfect. I took to the dog puppy "Ziggy" straight away and he seemed to take to me too. Now as anyone who has ever bought a puppy from a good breeder will tell you, buying a puppy is worse than going for a job interview. Good breeders want to make sure the dogs go to a good home. If you don't get the third degree from the breeders, walk away! It was decided, "Ziggy" was to join our household. When we got Ziggy he was about 10 weeks old and going through his monkey face stage. Look at the pictures and see what I mean. I have yet to see pictures of another puppy that has such a monkey face. He settled in pretty quickly and took to our westie like a long lost friend (little did Parsley know what the future held). Ziggy is my first Samoyed and through him I have learned that owning one should never be undertaken lightly. There has been times when I have considered that buying one was a real mistake but as any owner will tell you, it is hard to be angry at a Sammy for long as they are loveable rogues. They are a true canine party animal. Samoyeds are intelligent dogs and as such find things to do when they are bored. As puppies this usually consists of either chewing things or digging holes. If you plan to leave your Samoyed alone for any reasonable length of time then make sure he can not get to anything to harm himself. Ziggy learned to open kitchen cupboards and drawers at a very early age. He once even managed to get up to a worktop, pull down a screw top biscuit container, unscrew it and eat the contents. Even when provided with all types of toys, they still seem to prefer items of furniture. I once left a 1kg packet of Kellogs Country Store on the work top which he duly ate ! He was not a well puppy after eating that lot. I do not know if it is peculiar to Ziggy but he seems to love paper kitchen towels. If you have one in your pocket then it is a dead cert that he will pickpocket it from you. He loves people and gets very enthusiastic about his greetings. Greetings off the lead can be worrying as a happy Samoyed running at full boar to greet a stranger is not always a welcome sight. Samoyeds need to understand the heel command as soon as possible , otherwise they will look upon you as a sled and try to drag you off at full speed. I have found that getting Ziggy to come back can often be a bit of a chore , but not with a pocket full of Spillers Shapes (the only thing he loves better than paper towels) . Reverse psychology also works on samoyeds, if you have another dog (that is well behaved) then start fussing it and the sammy will soon come running back. Samoyeds can be very noisy dogs, despite what some books tell you, but at least it is always with reason. Ziggy barks at other dogs when he is on the lead, "Parsley" our Westie when she won't play, when he hears our car on the drive and of course when it is time for walkies. None of the above is excessive though and I suppose that as far as dogs go they are pretty quiet. Oh by the way , they pant like steam trains on hot summer nights. Ziggy also howls when he hears sheep, but a Sammy is amusing rather than annoying. 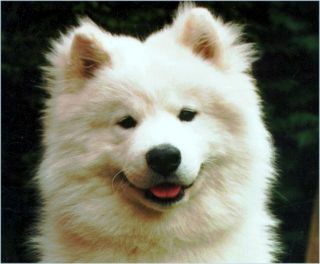 Samoyeds are very fast in short bursts and both agile and clumsy at the same time. Ziggy can clear a 3 foot fence from a standing jump and can keep up with the mother in laws wippet (sometimes). 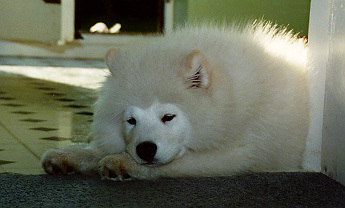 The text books say that samoyeds only moult twice a year. This should perhaps be rephrased to "Samoyeds have a major moult twice a year" and cast all year round. A bit of advice is to brush them regularily as in doing this the job is a lot easier. The fur round their bottom and the backs of their legs seems to be the most difficult to keep tidy. Neglect a Samoyeds coat at your peril ! 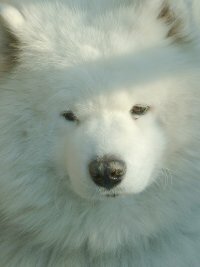 To sum up Samoyeds can be very sensitive to moods and will try to cheer you up if you are miserable. They can be a bit of a handful but there is never a day goes by where they do not bring a smile to your face. I could not imagine a more loyal yet devious creature. Ziggy is now 11 months old and to be honest the chewing has got worse, he even chews things in his sleep. He really likes people and seems to be destructive when left without human company. His only other bad habit is barking like mad to get to other dogs when he is on his lead. This can be very embarrassing as Sammy's can sound pretty vicious when they start barking and growling. (all show mind you). It is very hard to describe how affectionate a Samoyed can be towards people but they certainly consider you to be part of their pack. The only trouble is a Samoyed always wants to be affectionate when you are wearing black . Keep your Samoyed out of the bedroom or you might just wake up next to him with his head on your pillow. For some reason Ziggy and Jasper no longer get on at all. On their own they are both very passive natured dogs but put them together and they really seem to hate each other. I am not sure if it is because they are both full dogs and are fighting over Parsley (the westie) or it is just a leader of the pack type of affair. Jasper was my dog (along with my parents) as a puppy for a good few years so perhaps he is jealous. We have discovered another device to activate Ziggy's amusing howl, electronic alarm clocks. He seems to have made the transition over to the USA pretty well and generally copes OK with the summer heat. We are lucky that we live only a few hours away from the Sierra mountains so he gets to play in the snow in the winter months. He still like to bark at cats and other dogs and he has discovered the next best thing to lemmings (the food they eat in the tundra) in the shape of ground squirrels. He never gets close to catching one but that doesn't seem to spoil his fun. Since my last update in 2001 we havent really managed to effectively control Ziggy's thyroid problem. Although all his levels are being kept normal by his medicine and he is active and happy as he has ever been, his coat has become very poor. He suffers a few areas of dark skin where he has next to no coat and his tail is especially thin. He has however got back to his ideal weight and he is very fit. I cant tell you how sad his loss of coat makes me. The picture on the left was taken this summer but it does not really show his coat condition. 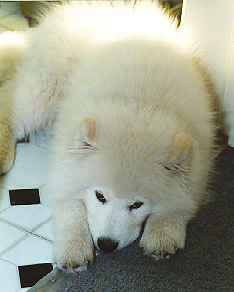 There is an excellent article on "Hypothyroidism" here on the mirage samoyeds website. Ziggy went on to the rainbow bridge on this day leaving a major hole in our lives. I cannot begin to express what a loss he was to me and my wife. He was taken from us very suddenly through illness and it was a total shock. It hit our other dog Parsley very hard as well and within a month of us losing Ziggy she decided to go join him. I vowed that I would never have another dog but the emptiness was too much to bear and we ended up bringing another samoyed into our lives. 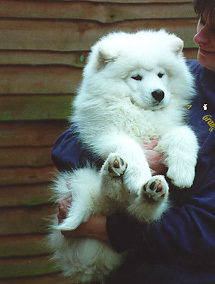 Angus the samoyed was born in the same month as Ziggy and we found him by chance in the same town in which we live. You can read about him in his own website.